Eddie was in his second year of college and had recently gotten a part-time job at a bookstore that was just a few blocks from his dormitory room. He loved his new job so much more than the job he had in his freshman year as a dishwasher in a local restaurant. Since he was studying modern literature in school it only made sense to have a job being surrounded by books rather than one washing dishes. With his new bookstore job Eddie was like a kid in a candy store. He loved books with a very intense passion. He loved to read them, he loved to hold them, he loved to smell them, and he loved to organize them. Some day he hoped to write them. Eddie also liked working for his boss, Mr. Henckle, who was well-read and had an extensive knowledge of both books and the bookselling world. 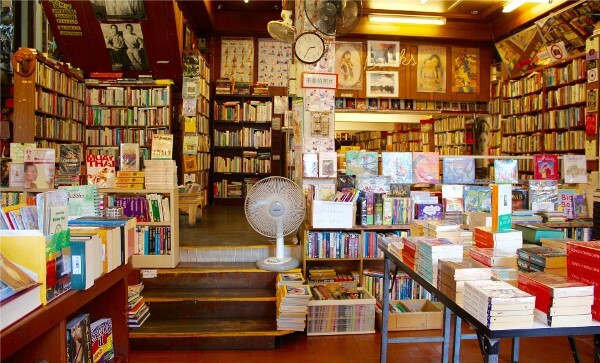 Instead of simply having a job in order to earn money for living expenses and further school expenses, this new bookstore job was also additional education. And, of course, there was the extra added employee bonus of being able to read books without having to buy them (provided he left them in pristine condition). One of the things Mr. Henckle stressed when Eddie first started working at the bookstore was the importance of employees knowing the stock. This was years before the advent of computers. One could not just punch the title into a computer to see if there was a copy in stock in the bookstore. The employee had to know if there was a copy of a book a customer asked for in the store and, if not, they needed to know exactly where to look for it. Mr. Henckle insisted that employees always notice the books as they stocked or moved books or even while dusting. “Always notice and commit to memory every book that you handle,” he said numerous times. Eddie took this to heart and he never handled a book without looking intensely at it and reading and memorizing the title and author and remembering exactly where he placed that book on the shelf. But Eddie considered feather dusters to be incredibly stupid tools. They did not pick up dust but rather just scattered the dust about. And every time he did his dusting chores he commenced to sneeze and sneeze. His eyes would water and he would repeatedly have to stop and blow his nose. He felt terrible after each dusting. But he tried to notice each book as he dusted just as Mr. Henckle had requested. The woman was wearing a large yellow flowery print dress that covered her large body like a tarp covers a piece of machinery. She had no makeup on and her short hair was unkempt. She had a very large purse hanging from her shoulder that was more like a beach bag than a purse. Her flowery perfume was overwhelming. The woman scrutinized Eddie for another long silent moment and then, with a huff, she turned and proceeded to walk out of the store. Eddie watched her leave. Before she left the store, though, she stopped at the cash register and began talking with Mr. Henckle. Being as far back in the store as he was, Eddie could not make out what she was saying. The woman then turned and pointed her finger at Eddie. Mr. Henckle turned to look at Eddie and then back at the woman. He shrugged his shoulders at her. After the woman left Mr. Henckle walked back to where Eddie was, “Eddie, this is the third time in the last week that you’ve screwed up. First you short-changed Mr. Eilenberger then you messed up Mrs. Danson’s order and now you’ve upset that woman — whatever her name is,” he looked back at the front of the store but the woman was gone. The very next evening Eddie was dusting the book shelves near the back of the store (and sneezing) while Mr. Henckle manned the cash register. After finishing dusting one book shelf unit he went around it to dust the next book shelf. And there stood the same large woman from the night before. She was still wearing the same flowery yellow print dress and her hair was still unkempt but this time her perfume, thankfully, was not as intense. Her face was covered with sweat. The woman wiped her face with her hand, “Listen, I’m really confused. I don’t know what the hell is going on…. I…. uh…. went to a psychic this afternoon. You see, I’ve been going through all this psychic stuff lately. This entity has been contacting me and trying to speak through me and stuff…. It’s really scary and stuff…. I just don’t know what to do.” The woman looked exasperated. Growing ever more nervous, Eddie did not know what to say. Eddie had no idea what to say. He stepped back from the woman ever so slightly as his nervousness intensified. The woman’s stare was intense but it slowly subsided and as it did she seemed to deflate. Her shoulders hunched as she then looked down at the floor. She slapped her forehead with the opened palm of her hand and just stood there for a couple of minutes staring at the floor. Eddie was downright scared. He had no idea what was going on. Finally, the woman took a deep breath and looked up at Eddie’s face. She then turned and walked away. Eddie watched her walk out of the store. Like the previous night, she stopped before exiting and said a few words to Mr. Henckle as she pointed back towards Eddie. And then she was gone. Eddie’s nervousness increased dramatically as Mr. Henckle walked back to where Eddie was. Reaching Eddie, Mr. Henckle said nothing as he held out his left hand towards Eddie. Reluctantly, Eddie handed over the feather duster to Mr. Henckle. And then Mr. Henckle spoke, “Go clock out. You’re done. You can pick up your final paycheck next week.” With feather duster in hand, Mr. Henckle turned and walked back to the cash register at the front of the store. With a very heavy heart, Eddie clocked out and left the store. It had been the best job he had ever had. He loved being in the company of books. He had tried so hard to learn every book in the store and where it was located. He had tried his hardest to please every customer and help them as best he could. He could not imagine ever finding another job that he loved as much. After exiting the bookstore Eddie walked several feet but then stopped and turned around. He stared at the storefront. He thought that he had finally found a job that he truly enjoyed which he could hold for the remainder of his schooling. And now he had lost it. He was overcome with sadness. Tears welled up in his eyes. After a couple of minutes, however, a surprising joy seemed to come up from somewhere within his being. He suddenly had something to be happy about. A tiny, almost imperceptible smile arose on his face as he realized that now he no longer had to ever deal with that darn feather duster again.